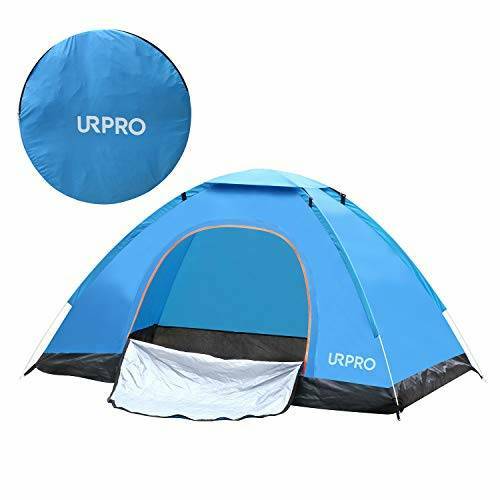 URPRO camping tent is lightweight and compact . Ideal for hiking , camping, hunting , travelling, fishing , pack picnic , BBQ and other outdoors activities . Top quality materials – URPRO camping tent is made by premium materials : The outer fabric is made of 190T waterproof silver plasters ; The underneath is made of 210D waterproof Oxford fabric . Both are waterproof and durability. Sufficient space – Unfolded size:78.74 X 51.1 X 43.3 IN . Its capacity is 2 people simultaneously. Easy to carry & use – This camping tent is unfolded automatically. It weighs only 0.92 KG (2.028LB )which is portable. A same color carrying case is come along with the tent. It is easily to be stored after folded up and you can also hang it up on wall with the hanging strap. More good features – Inside the tent, there is the pocket that you can keep your phone, key or other personal belongings; a mesh design on the tent top gives you a romantic night to see stars and maintain fresh air goes into the tent.